OSF HealthCare Dietitian Ashley Simper, MS, RD, LDN, recommends these tips to help you defrost your holiday bird safely: Keep your turkey in the freezer until you are ready to thaw it. Don’t store it in the garage, trunk or on the deck. You don’t know what could get into it and it’s harder to make sure the temperature stays below 40 degrees Fahrenheit. *** Remember the DANGER ZONE for foods is between 40-140 degrees Fahrenheit. When perishable food sits out for longer than 2 hours in the danger zone, it is at a greater risk of developing food-borne bacteria, which can make you and your whole family sick on Thanksgiving. 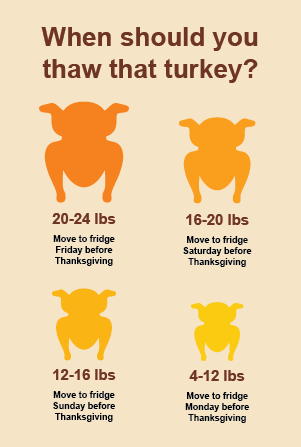 Keeping your turkey in the sink not only increases the chances of it staying in the danger zone for too long, but it can also contaminate the whole sink with raw turkey juices.